Jenn and I went to Spain last summer and had amazing seafood Paella at a few different places and I've been dying to attempt to make it myself ever since we returned. Luckily my Mom let me borrow her giant Le Creuset pot and some real Saffron, 'the world's most expensive spice by weight'. You can actually see a strand of it in my picture above right on a piece of chicken in the lower left hand corner. It's red and stringy. Anyway, I made way more food than Jenn and I could eat in a night so we'll be having Paella quite a lot this week but I can think of worse tragedies to befall on us. It also came out exactly how I was hoping. I used the Paella recipe in the Joy of Cooking as a reference but didn't agree with a lot of their decisions. So the Joy of Cooking recommended cooking the chicken ahead of time and adding mussels and shrimp at the very end right before serving. I decided this seemed like a terrible idea as I wanted to cook the rice in the broth from the mussels to begin with. So the first thing I did was to steam the mussels in 3 cups of water and 1 cup of white wine with a couple of tablespoons of minced garlic and some chopped cilantro. I had Jenn do a coarse chop of the veggies in the food processor (we just got one) and then I cooked the chicken breasts with half the veggies in some olive oil and seasoned them with some Konriko's Creole Seasoning. I made sure the chicken wasn't overcooked as you're supposed to bake the whole shebang in the oven for 15 minutes at the end at 350 degrees (I also pre-heated the oven). Once the chicken was almost done I took it out and Jenn sliced it and I set it aside. 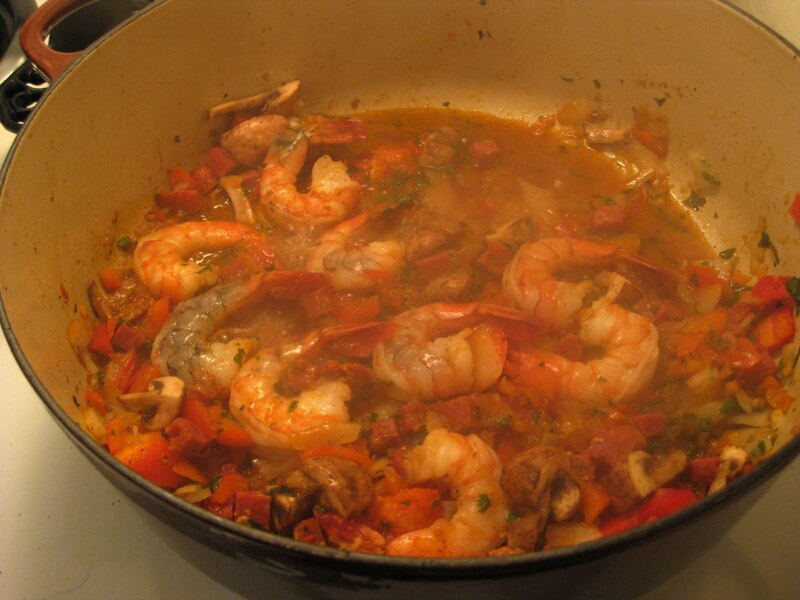 Then I took the other half of the veggies and cooked them with the shrimp and some more creole seasoning. For whatever reason I put Cajun spices on everything. 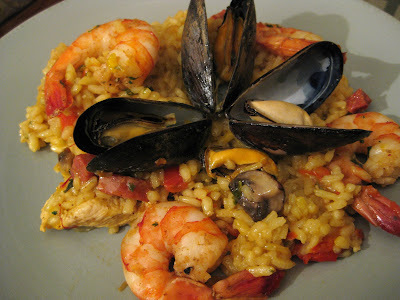 I took out the shrimp and the mussels when they had opened and set those aside separately since I didn't want to over cook them and decided I'd add them at the very end and let the rice heat them when serving. I also set aside the wonderful broth from the mussels and added a tsp. of chicken bouillon. So then I put all the cooked veggies and the sliced, mostly cooked chicken in the pan and slowly added the rice and broth, stirring often. I made it as if I was making risotto as it's the same type of rice. You want to coat the rice with a little fat (olive oil in this case) and then slowly let it soak up the broth. 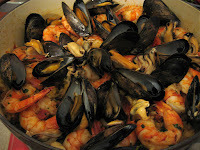 Although knowing that it was going to cook more in the oven I just got it started, stirred and then stuck it all in the oven saving the mussels and shrimp for the end. When it came out all the rice was at the bottom so I had to stir it again but it was perfect. If you want to adjust the recipe it's just 1 part rice to 2 parts broth. If you make this I hope you enjoy it as much as we did. I think it's one of the best things I've ever made.